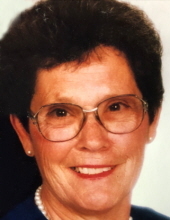 Marjorie Annette Sutton, age 82 years and 10 months, went home to be with her Lord and Saviour on Wednesday morning, March 13, 2019. Marjorie passed away peacefully in her home in Bettie, Texas surrounded by her loving family. She was born in Boskeydell, Illinois on May 16, 1936 to Rev. Hugh and Edith Stearns. She was a graduate of the 1954 class of Carbondale Community High School in Carbondale, Illinois. Marjorie was previously employed by Carbondale Elementary School District #95 and Carbondale WalMart. Marjorie was a devoted wife, mother, grandmother and great grandmother. She was married to her high school sweetheart, Ward Jr. Sutton for 64 years and five months. This union was blessed with four children, 11 grandchildren and 15 great grandchildren. Her most beautiful and loving life will forever be cherished in the lives of her children: Dotty (Darrell) Potter of Caledonia, Michigan; Susan (Gary) Sutton Kerber of Carbondale, Illinois; Judy (Art) Tordini of Port Angeles, Washington and A. Ward Sutton (Leslie) of Bettie, Texas. Marjorie's pride and joy of her entire world were her grandchildren: Doug (Melissa) Towner, Dan (Lillian) Towner, Demy Potter, J.D. (Betsy) Piland, Adam (Jessi) Kerber, A.J. (Stephanie) Tordini, Lisa (Javier) Becerra, Jeremy (Nicole) Sutton, Rylee and Landry Davidson, and Colt Sutton. Great grandchildren are: Violet and Ellie Towner, Eliyanah Towner, Jack Marti, Aly Piland, Evan Frye, Charley Kerber, Baby Tordini (May 2019), Isabelle, Skylar and Remington Sutton, Camryn, Cruz, Carlee and Baby Girl (May 2019) Becerra. Surviving are also her sisters, Fay Heern, Joy Sanders and Effie Brimmer of Boskeydell, Illinois. She was preceded in death by her parents: Hugh and Edith Stearns, her six brothers: Gilbert, Vern, Clinton, Paul, David and John Stearns and her three sisters: Kathleen Neal, Ruby Holder and Rose Lipe. "Mrs. Marge" was a very dedicated and active member of Oak Hill Missionary Baptist Church in Gilmer, Texas. She loved her church family. Marjorie and Ward moved from Carbondale, Illinois over 19 years ago and she had made many friends and neighbors. She enjoyed her retirement years being outside tending to her flowers and tomato plants, doing yard work and mowing on her favorite tractor with her big sunhat on. for the new Family Life Center, in memory of Marge Sutton, P. O. Box 1437, Gilmer, TX 75644. To send flowers or a remembrance gift to the family of Marjorie Annette Sutton, please visit our Tribute Store. "Email Address" would like to share the life celebration of Marjorie Annette Sutton. Click on the "link" to go to share a favorite memory or leave a condolence message for the family.